Dynamic ads for Clients who were interested in Products on a Ecommerce site and did not complete the Purchase. Fialkov Digital is an advertising agency focusing on internet sales and lead production. The agency specializes in the utilization and application of advanced tools in the social networks and Google, and especially in advanced advertisement options on Facebook. Medi-Link is an internet pharmacy ecommerce website. Its owners, Tamir and Eyal, started their way in the retail world 30 years ago, with the establishment of private pharmacies. 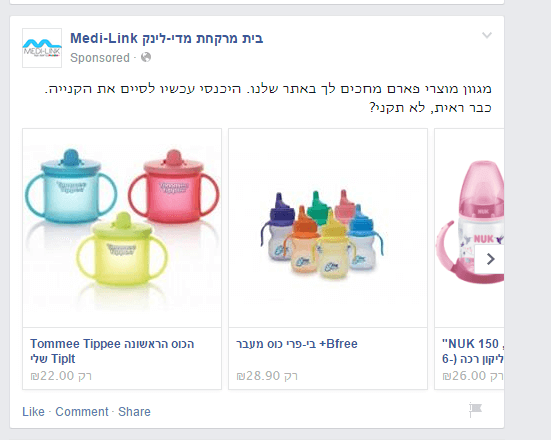 Today, after years of experience and knowledge of the Israeli market, Medi-Link enables convenient shopping, without parking, without waiting in line, and in cost-effective prices. Fialkov Digital advertises on Facebook to bring new clients to Medi-Link and to return clients who were interested in certain products or started a purchase but never completed the transaction. We use a number of advanced tools to bring clients. 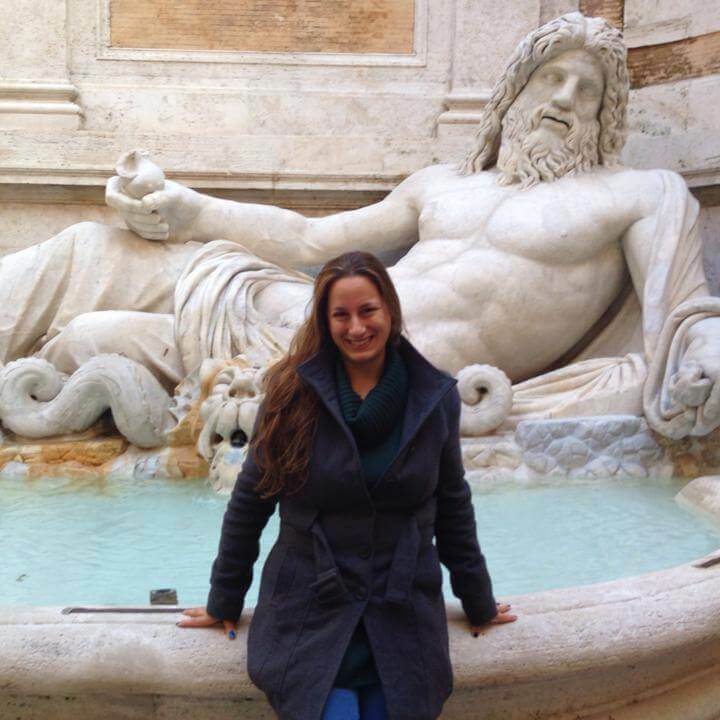 Using the Custom Audience to make existing clients re-enter the Facebook page and the website. A correct use in the Lookalike took to locate new audiences, similar to our original one. The tool that we use in the current campaign is a new campaign type, which is called Dynamic Remarketing. This means that if a client enters the website and takes interest in a specific product, that same product will appear in the Facebook ads, rather than random products or random ads. We use Facebook to bring focused traffic into the website. In cases that a client enters a site and took interest in a certain area or a product, or started to buy something but never completed the transaction, we use Dynamic Remarketing to introduce to him the items he was interested in while surfing on Facebook. The Dynamic Remarketing tool proved to be most efficient and brings about excellent results of entrances and purchases in the website. 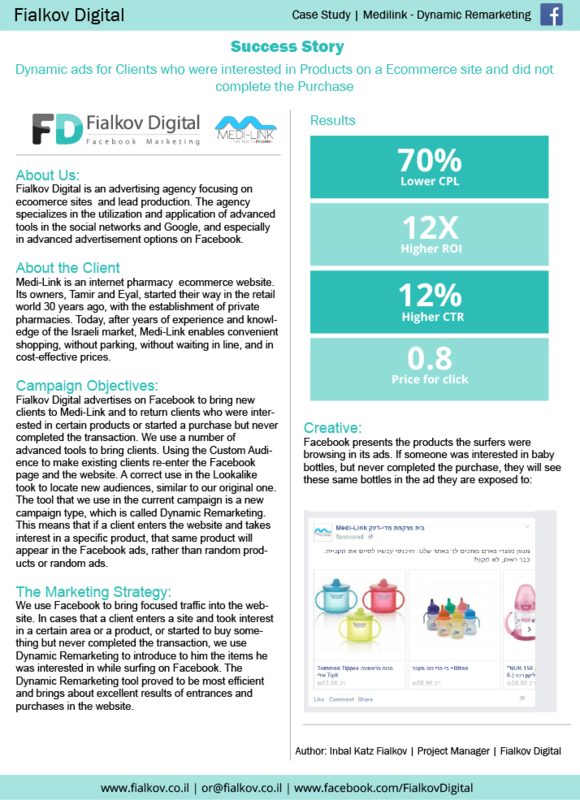 Today, Fialkov Digital is one of the single Agency’s in Israel using the Dynamic Remarketing tool. 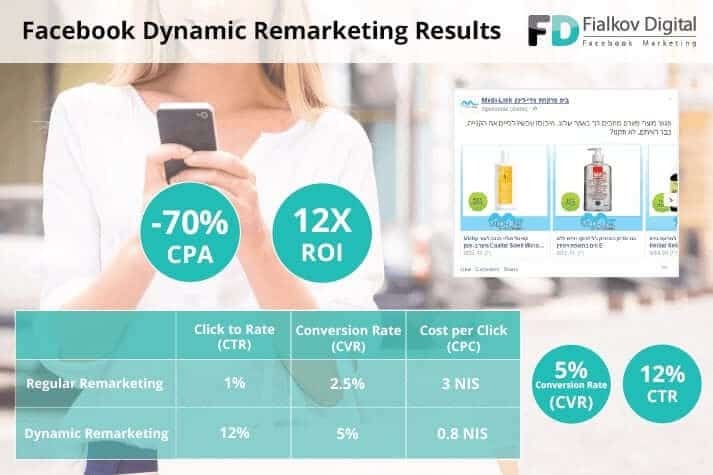 The advantage of this tool in comparison with the regular remarketing is the ability to market specific products that the client is interested in, rather than a general banner. Using dynamic remarketing brought a decrease of up to 70% in conversion costs. “Facebook’s dynamic remarketing enables us to present focused ads for each client, according to the products he was browsing, or the products he added to his shopping cart. Thus, we increase the purchase percents in the site and make surfers complete their purchase process. Facebook’s new tool allows us to target people rather than cookies and advertise cross-platforms while raising awareness in all platforms, both mobile and desktop”. CTR rose from 1% to 12%. Conversion rates rose from 2.5% to 5%. Clicking cost decreased from 3 NIS to 0.8 NIS.